Two rare films of soldiers at Gallipoli. 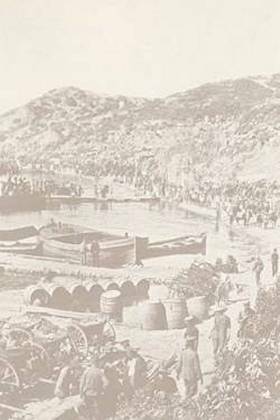 The Lemnos Gallipoli Commemorative Committee Inc (lemnosgallipolicc.blogspot.com.au) provides more information. See also Heroes of Gallipoli (New Zealand Herald, 24 Apr 2009) and Friendly fire hits Anzac historian (The Age, 23 Apr 2010) for information that includes the controversy over whether certain men in the film were Australians or New Zealanders. Short video clip from Film Australia that includes some Gallipoli scenes, with suggested activities relating in particular to Australian identity. Short video. At Gallipolli only at the end. Short video. "The man with the donkey." Feature film using real army camp footage and a re-enactment of the Gallipli landing. Four sections of about 3 minutes each. See also next item. The stories of realistic films on Gallipoli (but re-creations, not involving original footage) that have contributed to the formation of the Anzac legend. Includes clips from the films. See also previous item. Comments on several films on the Dardanelles and Gallipoli campaign. YouTube videos are embedded in the page. "One of the most brilliant generals of World War I and an architect of Anzac Day, Sir John Monash helped create the Anzac legend by ensuring the courage of his men was enshrined in Australian history."